Our free landscaping ideas, designs, illustrations and pictures will boost your garden design abilities. Follow our unique approach to stimulate your imagination. Get that sudden burst of inspiration. Feel the anticipation and excitement of showing your new garden to your friends. How do you get that elusive inspiration? You know you want something special, but your imagination just draws a blank. It’s like writers block to an author. Nothing wants to flow. Don’t despair! The fun is just beginning! A little bit of time spent upfront will unlock your creative talent. Read Alison’s article Inspiration for Garden Landscaping Design, and Future Trends for more inspiration. Look at some pictures in nature. See how they look in a rock garden design picture (a new window will open). A brand new Japanese Garden Designs Package has been added to our portfolio. It combines our best Japanese designs into one low cost package, ready for instant download. This will give you valuable ideas for landscaping your garden . Excited to get going? Follow these steps to focus your mind on the best garden landscaping idea for your garden. Take out some of the photos and put them in your landscaping ideas box. Who knows, maybe having something similar at home could be just what you need. Or maybe you can just recreate one small part of it in the corner. But wait, I’m getting ahead of myself. There are more places for wonderful ideas. Go to your local nursery. Take a leisurely walk through the various sections. Which plants do you prefer? What are your favourite flowers? Notice the texture and color of the foliage. Isn’t that statue pretty? That water fountain reminds me of ... Yes, take your time and just get to know your own needs. Visit a botanical garden. Yes, you got it! Don’t forget your camera. Stroll through the garden and look at the focal points. Notice the way plants are grouped together. Look at which plants are flourishing and would thrive in your garden. Add the best pictures to your landscaping ideas box! Get a better feel for your preferences by looking at a book or two. Choose books with lots of pictures. Make notes of what appeals the most to you. Take a walk down to your local news stand and purchase a gardening magazine . Look closely at the gardens in your neighborhood. Looking is free and you will get a feel of what will work for you. Browse through a few magazines. Notice the various designs and plants. Cut out the pictures that appeal to you. Put the pictures in your landscaping ideas box. You should have a pretty good idea of your preferences by now. The next step is to see how it will fit in with the various design styles. If you choose to enlist a landscaping service for help with anything, it’ll depend on what type of project and the scale of it. You should consider whether you need someone who specializes in specific aspects, such as design, or someone who covers a wide range of services like this Burlington landscaping company. Gardens are categorized into different landscaping styles. Each style has its own identifying characteristics. Keep to these styles to ensure that your completed garden is well structured. Don’t worry, there is still endless scope for your individual creativity to shine through. Japanese gardens blend culture, religion and tradition into nature. Most Japanese gardens are created for meditation purposes. Symbolism forms the backbone of a successful Japanese garden design. This style is most probably the most difficult to get perfect. But boy, if you get it right, it is just spectacular! Click on the picture or this link for more information (a new window will open). A formal garden style would match any building with straight boundaries. Geometry and proportions is important. Symmetry, perspective and pattern play a key role in the formal garden design. Symmetry means that the garden is mirrored to look the same on both sides. The formal design plan begins with regularizing the space available. The plan works outward from the house’s doors and windows. This governs the location of paths and hedges, and the division of the remaining space. Consider an English formal garden if you love the classics! The informal garden is a practical, workable garden. Balance is an important design aspect of this style. Informal balance relies heavily on soft curving lines. Undulating levels (grand levels and slopes) are also important. Bold curved lines work well. Too many curves will look too busy and spoil the flow. The curves should lead your eye gently through the garden. A few well placed focal points contribute to the harmony of this landscaping style. Why do so many people love a Tuscan landscape design ? Could it be the twisted olives, meadows filled with beautiful wild flowers, azure skies and fine covered pergolas dangling with delicious grapes? This may influence them, but, the bottom line is… Tuscany is charming! Bring a bit of Italy home in a Tuscan landscaping idea. Create a Tuscan mood in your home and garden. Paint your home in earthy tones. Dry, earthy shades of ochre, dusky pink and muted gold blends in with the rustic farmhouse types. Tuscan furniture is normally café styled. The cottage garden is a formal garden style. This means that the garden is balanced on either side of the central line of the garden. A cottage garden normally contains culinary herbs, flowers, vegetables and fruit. Spark your creativity for a cottage garden design with our landscaping ideas and pictures. Fragrant plants contribute to meditation. Garden colors determine moods. Plants affect your physical and mental well-being. I have used plants with success in meditation garden designs. So, let’s get your meditation garden fixed and you can enjoy a quiet moment. The beauty and fragrance of a rose garden inspires and stirs the soul. Roses have captured the hearts of many. Poets have praised the rose, writers have written books, composers have composed songs and singers have sung about roses for thousands of years. Lovers have expressed their undying love with roses. Design a rose garden to share the magic of these amazing flowers. Choose a garden design theme and style for your design. A number of factors influence the suitability of a garden design theme. A garden design style is a characteristic way in which a garden is designed. 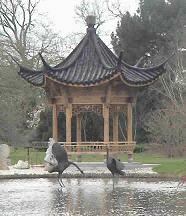 Examples of different styles are; Formal garden, Japanese garden, Cottage garden, etc. A garden design theme is the topic for the garden, for example roses, white and pink, water wise, etc. So for each style of garden, you may choose a variety of themes to make it personal. Hard landscaping items are things like walls, pathways, gazebos, greenhouses, water features and fountains. They are essential elements of a garden. They provide items fro human comfort and entertainment. Water features, ponds , fountains and statues are excellent focal points in a landscape. Terraces are not only functional in soil retention, but also provide a perfect stage for displaying your favorite plants. Don’t you sometimes wish you could have a special spot to relax and view your beautiful garden? Or maybe a comfortable place to just get away from everything? I have the answer. A Gazebo! From an elevated or sunken position, protected from the sun and elements, you will be able to enjoy more than human comfort. Get out your landscaping ideas box! Use your newly acquired background on landscape styles to sort out your pictures. Put them in piles that will resemble the different design styles. Soon you will see a pattern evolving. If you find pictures that you are unsure about leave them to one side. You will review them later to see how you can fit them in your final design. The largest piles indicate your preferred landscaping styles. Make a short list of these styles. By now you have a very good idea of what you want. The next step is to see if your landscaping ideas will work for you. The above list is just an indication of what you need to consider. More factors and design criteria are available on our Garden Design page. There may also be other factors that are peculiar to your family. Evaluate your short listed landscaping ideas against the above criteria. Make a list of pros and cons for each style on your shortlist. What a lot of work! Time spent on all the ground work (sorry for the pun), is time well spent. If you have completed all the groundwork, you will have saved yourself a lot of heartache later! Trust me! Almost done! Take all your hard work and ideas and discuss it with your family. Now is the time to get their buy-in to your landscaping ideas. They might even add a few useful ideas (if they were not involved all the way). Together you will be able to select the style that will enhance your lifestyle and complement your home. Good! You now have selected your final landscaping idea. The next step is to complete the actual garden design. Go to our Garden Design page to learn how to do the actual garden design!